I have always wanted to try these little pillows of goodness ever since my brother had told me of eating them in New York, I think he paid $8 for 2 tiny ones. With this recipe you will be able to stretch the dollar A LOT further. The sweet fluffy buns, succulent juicy pork and the freshness of the pickles will leave you wanting more and more and more….I do have to mention that I cheated on the buns and bought a pre packaged Banh Bao Flour Mix from my local asian supermarket, I didn’t even know they made it pre packaged like this – heaven sent! The hard work isn’t done for you though, you will still have to knead the dough, let it rest and knead again and roll out. The buns can be made and steamed ahead of time, store in the fridge for 1 day or in the freezer for 2 months. I was lucky enough to have some Pork Belly already poached sitting in the freezer, just defrosted it, sliced into pieces and shallow fried-done! You could also use Char Sui Pork or Peking Duck. This recipe would have to be one of my favourites, right up there with the Twice Cooked Pork Belly with Citrus Caramel Dressing. To pickle cucumbers, add the salt, sugar and cucumbers to a container or jar, shake to cover and place in the fridge for at least an hour. Its amazing, as the salt and sugar draw all the moisture from the cucumbers and the jar fills up with a beautiful sweet/salty liquid. They will last 1 month in the fridge. Start the pork buns per packet instructions. I decided to shape mine like envelopes (momofuku style) I have made them the traditional way before and I found this way alot easier “always like easier”. It makes about 12-16 buns. Divide your dough up, roll into circles about 1/2 cm thick, place onto a piece of baking paper, spray the bun and using a chopstick, fold the bun over the chopstick and then remove. First time I did these they stuck together, so the oil should prevent this from happening. Place buns into a large steamer, be sure not to place them too closely together as they will expand . Buns should take about 10 minutes. Cover the cooked buns with a tea towel and continue with the rest. Heat enough oil in a large frypan or wok to shallow fry the pork belly, will take about 4 minutes. Drain on paper towel. 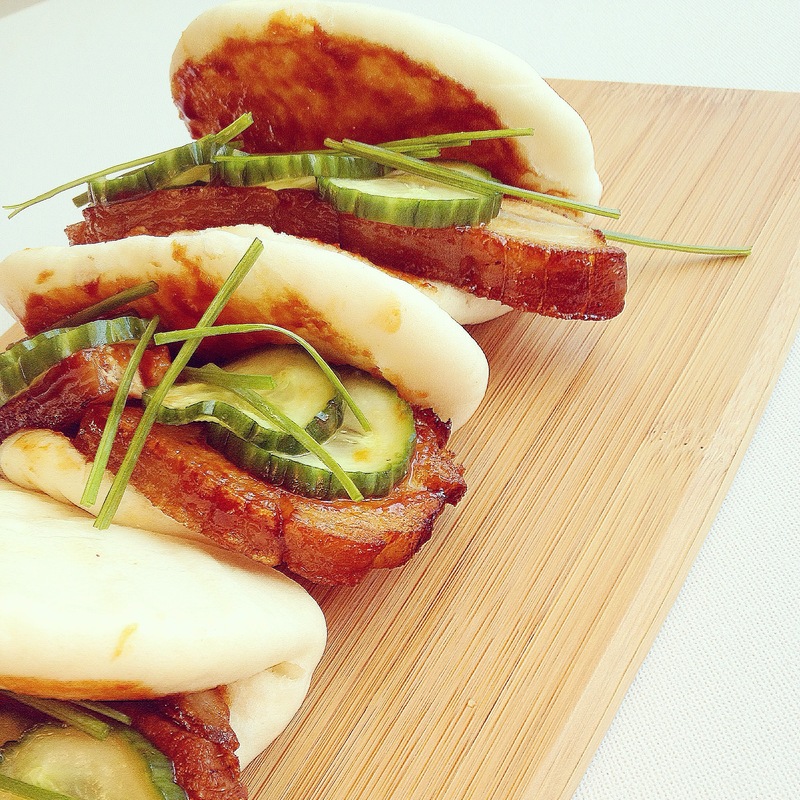 To assemble, brush the buns with hoisin, layer with the pork belly, pickled cucumber and garnish with spring onion. Yum! I could happily eat a few of those!